Recognize that in the picture? 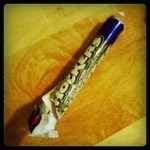 its a roll of Shockers previously called ShockTarts before Wonka re-branded them. As you can see the roll is partially eaten. I have a thing for sour candy, whenever i see these i get a few rolls at a time because they fit in my jeans. I just threw away the wrapper from the last roll that was on my nightstand along with all the blue pieces. i don't eat blue food, something that was added when they switched from ShockTarts to Shockers. Capture the Everyday is about getting you to capture those everyday moments in your life! Each Thursday, Adventuroo issue a simple challenge to capture something that’s a part of your daily life. You can post just a picture or add some words to go along with it. You’ll have a week to get it done and then I’ll issue another. It’s a quick, easy way to start capturing those little parts of life we sometimes take for granted.